Netflix just got a lot cheaper looking. 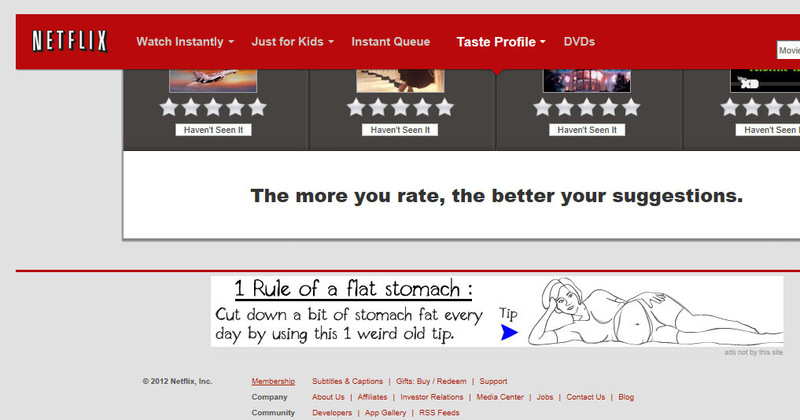 Last night I logged into Netflix and found an annoying banner advertisement just like any other website. The ads load directly under the famous Netflix navigation, and subsequently push all the video controls out of reach. And, the scrollbar wouldn’t work in either Internet Explorer or Firefox. Toggling the control, alt and delete keys reduced the browser window size slightly and allowed me to access the video and sound controls. The ads also appear on the bottom of the page. Has my Netflix account been hacked? And if so, how has the hack affected both IE and FF? Or has the ad integration been authorized by Netflix? Since Netflix is a paid service, it would be hard to imagine the web ads are Netflix’s doing. We’ll try to get to the bottom of this and post a follow up. [Update] We removed the extension FireFox Giant Savings and it seemed to do the trick. The extension can be removed from the FF extensions in the browser options. But you should also delete from the program files. Do this from the Add/Remove programs in Windows Control Panel. The problem went away in IE and FF. Previous Previous post: DIRECTV being forced to add EPIX? Also will be inserted with a program called ‘Coupon Companion’, with extensions in Firefox, and Chrome call ‘Coupon Companion’ as well.